Online search has become integral to our lives. Want to know where the nearest coffee shop is? Google it. Looking for Sunday brunch but don’t know which restaurant serves the best mimosas? Look it up on TripAdvisor. The same goes for prospective patients who are looking for a service you offer. They’re looking for the best doctor by searching online. That’s why it’s important to prioritize your practice website’s online visibility. Here are five medical marketing ideas that your practice can implement to improve its online visibility and attract new patients. It provides fresh content that search engine crawlers evaluate to determine relevance and authority. The more relevant you appear to people searching for a specialist doctor, the more likely you are to show up for searches by prospective patients. And blog posts help you gain credibility and showcase your expertise on a specific topic. When people see that you care enough to talk through a procedure or answer common questions through accessible content they are likely to feel a greater sense of trust and engagement. Did you know that 80% of people would trust an online review as much as a personal recommendation? Therefore, your practice needs positive online reviews to stand out among patients who are comparing you to other specialists in your area. Having more reviews can help you stand out and rank higher on sites like Google Maps and other major online directories. Confirm your practice’s identity on various directories online such as Google Maps, Yelp, White Page etc. It doesn’t take much time (15 minutes per directory) but can have an amazing positive impact on your practice’s visibility. 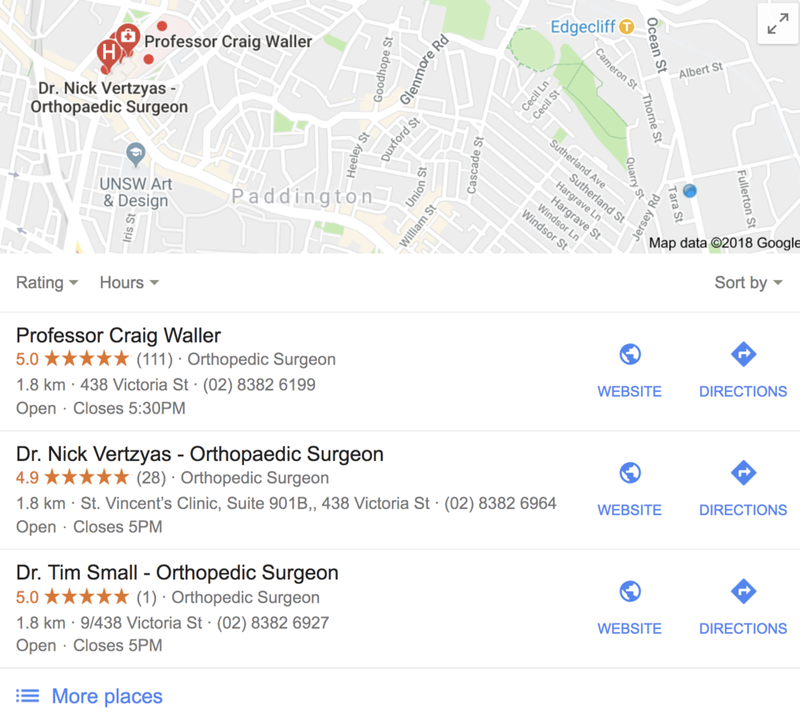 Plus, verifying your listing provides you with access to a dashboard that allows you to edit your information such as your practice name, address, and phone number which are critical components in ranking within Google's Local Snack Pack. Typically, the first three to four search engine results are paid ads. Paid ads are used by various surgeons practices to target prospective patients at the exact moment they search for services they offer. This is much more effective than traditional advertising where you’re typically interrupting someone. And, since search ads always appear at the top of results pages, they have maximum visibility to your target audience. Because of their design, users don’t always identify an ad and may think it’s an organic result. Paid search ads can be a cost-effective approach when managed well. Paid search can improve your practice website’s online visibility within days, and provide easy-to-track analytics to help you understand your return on investment. Remarketing refers to ads that are shown to people who have previously visited your website. Visitors are identified by placing cookies (tracking code) in their search history which then triggers your ad to appear while that visitor searches for other services online. Remarketing is useful because allows you to engage visitors that didn’t take a desired action on your site (e.g. contacting you and filling out a form). Additionally, remarketing is more cost effective because you’re targeting people who have already interacted with your practice in some way, shape or form – instead of targeting people who have never heard of your practice yet. Using these 5 tactics can help improve your website’s online visibility to attract and convert new patients. For more ideas on how to improve your online presence, contact us on 1300 880 230 or ask us a question HERE and click on the ASK button.